After the tsunami struck Southeast Asia on Dec 26, 2004, I attempted to travel to SE Asia with several large non-profit groups including the Red Cross, World Vision, World Concern, etc, and I was quickly rebuffed in my efforts, so I ended up going to eastern Sri Lanka on my own without any backing from any non-profit groups. I had searched the internet for relief organizations working in SE Asia and I contacted a Muslim man (Muzza) who was the moderator/director of Samadana/M, a Non-Governmental-Organization (NGO) based in Kandy. Samadana/M is a champion for civil rights, particularly for women and children, and it's board is made up of people of different faiths including Muslim, Christian, and Buddhist. Muzza sent his brother and a friend to pick me up at the airport north of Colombo (capital city of Sri Lanka) about midnight, and I was wisked me away in a cargo van without windows or rear seats for the 6-hour trip east to Kandy. After spending a few days in Kandy, Muzza's brother drove us to Kalmunai, a town located on the eastern coast in the Ampara District. The Ampara District, which was the hardest hit area in Sri Lanka and where more than 10,400 lives were lost, also had more than 3,000 new widows due to the tsunami. I spent the remainder of my time working with Dr. Raeez and his family through their non-profit organization (NGO) AERO on various "back-to-work" projects to help tsunami victims during the months of February-March 2005 & June 2005. 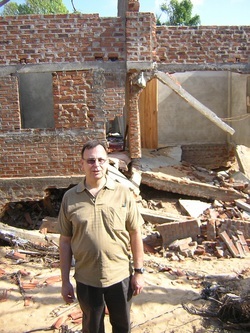 During those trips in 2005, I lived & worked in a Muslim community with a Dr. Raeez and his family in Kalmunai, helping Christians, Buddhists, Hindus, and Muslims to recover from the tsunami. The focus of these two trips was to get people back to work by providing simple tools for craftsmen, bicycles, and sewing machines. Although I paid for these trips myself and went to Sri Lanka without financial funding, I eventually received donations from friends, church, and family to help cover the costs. Without the help from others, I would not have been able to do near as much during these missions, and I am forever grateful. My trips to the Ampara District in Sri Lanka were each for a duration of 30-days, which coincided with the limit on a 30-day tourist visa. For my second Mission of Hope to Sri Lanka, I had financial support from the start. I already had a following of people who knew and understood what I was trying to accomplish, and I was able to raise funds to combine with my personal finances, so we (my supporters and I) were able to do even more than during my first trip. We continued to get people back to work by purchasing tools, sewing machines, and bicycles. I also helped AERO create a non-profit construction company that would use craftsmen that we had been helping with tools, and additional equipment (manually operated concrete block-making machines, concrete mixer, etc). All of the tools and equipment was purchased locally so that the local economy would benefit from the influx of money, and the equipment made it possible for the new "company" to get work contracts from local NGO's which had funds available for reconstruction projects. We also built the first two houses in Kalmunai following the tsunami which destroyed thousands of houses and left so many people homeless in relief camps. The efforts of this Mission of Hope truly did give hope to many people who would have otherwise continued to suffer. The people being helped were among the poorest of the poor and the most disadvantaged in Christian, Hindu, Buddhist, and Muslim communities.